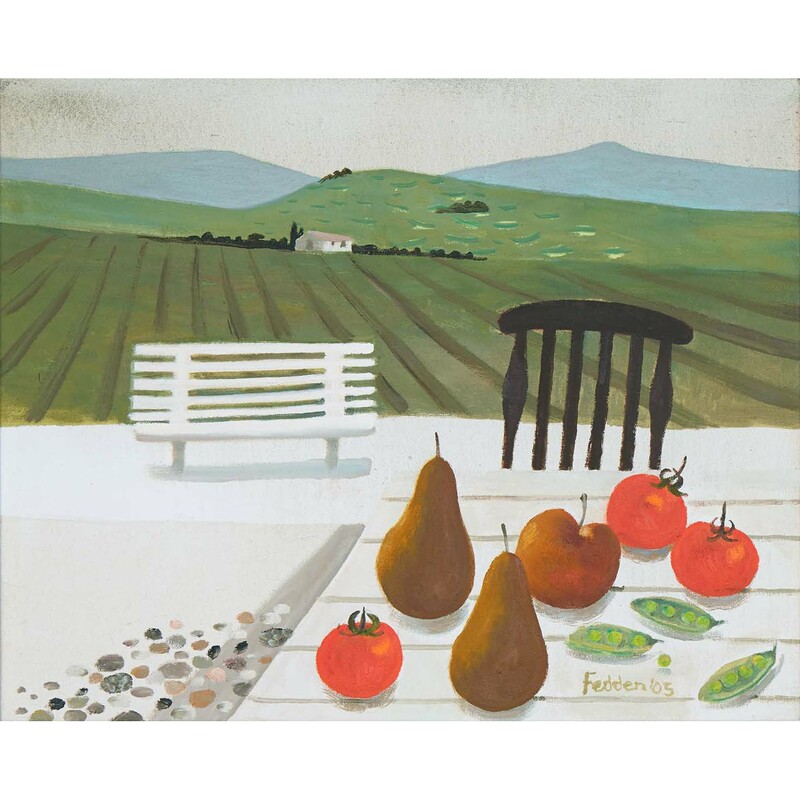 Mary Fedden was a British artist whose finely executed paintings often took the form of a hybrid between a still life of everyday objects (usually in the foreground) and a landscape (used as the backdrop). As in this painting, she would typically position a group of objects such as fruit, bottles and cats depicted in fine detail in front of a striking background scene. Over the years she became best known for such bold, vivid still lifes and her colourful views of France, Tuscany and North Africa. This large oil painting, Tuscan landscape, is a fine example of such works. Although it is difficult to be precise about the exact location of this work, when creating a painting Mary Fedden often used references from her many sketchbooks made during her extensive travels. She often stayed with friends near Arezzo in Tuscany, for example, so maybe Tuscan landscape comes from that area, with plenty of the artist’s imagination thrown in! MARY FEDDEN. TUSCAN LANDSCAPE. Available for sale – please contact us for further details.